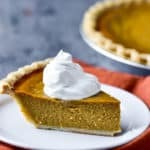 This pumpkin pie is super easy and delicious. Make it one day before serving. Adjust the spices to your personal preference and you'll be the pie hero! Position rack in the center of the oven. Preheat oven to 425° F. In large bowl, whisk pumpkin puree, sweetened condensed milk, eggs, spices (cinnamon, ginger, nutmeg, and allspice) and salt until smooth. Pour pumpkin mixture into crust. Bake 15 minutes. Reduce oven temperature to 350° F and continue baking 35 to 40 minutes or until knife or toothpick inserted 1 inch from crust comes out clean. Allow pie to cool. Top with whipped topping or whipped cream if desired.